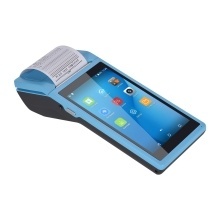 Intelligent payment terminal device, performs well as receipt printer and camera, supports 3G, WiFi, BT4.0, 4GB NAND Flash. Compact size and wireless design, easy to carry around and convenient to use; built-in 5000mAh rechargeable battery supports enduring working time. Built-in pos receipt printer uses 58*35mm printing paper, no need of print cartridges or ribbons for low operating cost, low noise and high speed while printing. This PDA printer comes with Android 6.0 OS, smooth and stable operation, great for Android-based apps which need the function of printing. User-friendly — smart POS terminal is very efficient in processing sales and suits for warehouse management and small business like cafeteria, boutique, bookstore, etc. Four configurations are available: 3G Communication/ 3G Communication+1D Scanning / 3G Communication+NFC module / 3G Communication+1D Scanning+NFC module.